If you’ve just achieved a bullseye with a macchiato, you’ve probably found this page after frantically Googling “how to get coffee stains out of carpet”. Now, take a deep breath and don’t panic! Coffee stains are totally solvable – and we’ve got all the answers right here. 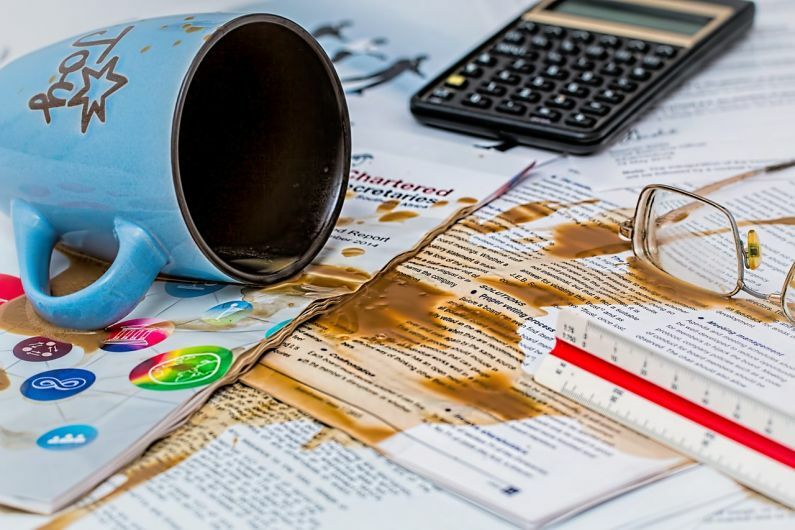 This article may be geared towards workplace coffee spills, but the advice will work on carpets of any kind! Get your stain remover at the ready as we explain how to get coffee stains out of the office carpet (before your boss finds out, or your clients arrive). Before you do anything else, get on your hands and knees and blot up as much excess liquid as you can – as soon as you can. If you can absorb as much coffee as possible, the less there will be to sink into your carpet. Kitchen towel is a good option for blotting up coffee, but an absorbent tea towel will also do a decent job. Make sure you only blot, don’t rub or scrub. This will rub the coffee deeper into the carpet. Now it’s time to tackle the stain that remains. There are lots of different formulas and options you might want to try at this point. A store-bought stain remover (designed for use on carpets) is one good option, but if you don’t happen to have any handy, there are some very effective DIY options you could try. One tablespoon of washing up liquid, mixed with a tablespoon of white wine vinegar and around 500ml of water is a very good substitute if you’re in a pinch. Either follow the instructions on your carpet treatment, or apply a little of your DIY mixture using a clean cloth, dabbing it onto the stain a little at a time. Blot the stain with a clean, dry towel regularly as you go. If the stain is especially stubborn, you might want to consider applying a paste of water and baking powder, leaving it to dry, then vacuuming it up. Finally blot the area with plain, cold water to take care of any vinegary scent or to remove the last traces of product from your carpet. Once clean, gently dab the area dry with a clean towel or kitchen roll. And there you have it, a perfectly clean surface! Disaster averted. From emergency carpet cleaning to full cleaning rotas, The Abbey Cleaning Service’s job is to keep the offices of South Wales looking clean and professional. With decades of experience, we are trusted across the region for the quality of our office cleaning services. Contact us today on 029 2067 9323.